yes, those tubs are all full of mice! in preparation for applying to nutritional science master’s programs in december, david has been working in a medical research lab on campus. from the very beginning he’s told me so crazy tales of doing experiments on mice: cutting out their beating hearts, injecting them with fluids and measuring their blood pressure via their tails. i don’t by any means like mice, but when i finally got to see the action firsthand on saturday, i felt sad for the little guys. any time someone tells david he’s a meanie to those mice, he says, “tell me that again anytime you take advil or any medication tested on mice!” okay okay, it’s for a greater good. but i mean – just look at those pics! but i really am impressed with his skills. lookin like a real deal doctor!…i just hope this isn’t top secret stuff i’m putting up on the internet. 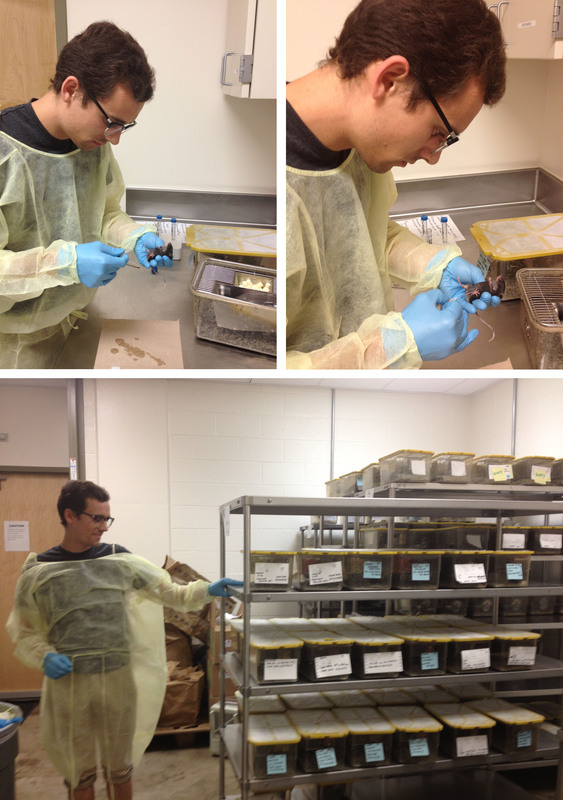 This entry was posted in kunz life and tagged david's life, lab research, mouse doctor. Bookmark the permalink.